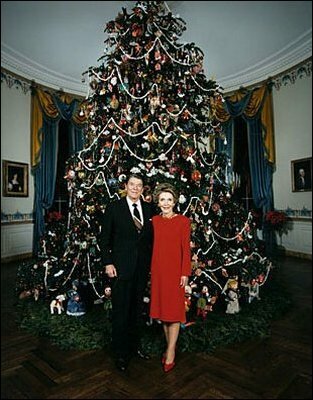 The 1986 Reagan tree featured decorations based on the theme, Mother Goose Christmas. The trimmings included wooden gingerbread cookie ornaments, state balls, Christmas card ornaments, soft sculpture miniature geese and a soft sculpture angel on top. At the base of the tree were 15 soft sculpture scenes of characters from Mother Goose rhymes.